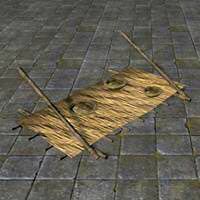 Argonian Rack, Drying is a superior (blue) quality Furniture in The Elder Scrolls Online. Crafted, Clothing Station. Requires Pattern: Argonian Rack, Drying. Patterns are found randomly in containers around tamriel, and can be traded and sold by players. Some special patterns are only available from pickpocketing or as special rewards. Houses: The Ample Domicile, Grand Topal Hideaway, Humblemud, Stay-Moist Mansion.